Cancer is a word you never want to hear, but when you do it changes your entire life. However, it does not have to be the end of happiness or living. 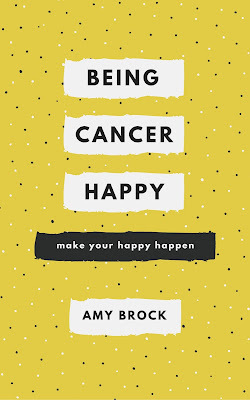 Being Cancer Happy is an informative cancer self-help book to encourage happiness while fighting cancer. I found out at 38 I had breast cancer. I was a a wife, daughter, and mother to two young children. I was able to maintain my happiness while in the midst of life, treatments, side effects, and all things cancer. I believe you have to make your happy happen. It was not always easy, but I found ways to manage living, laughing, and loving through it all. I used my life experiences, humor, and positive outlook to define cancer and provide a positive spin on a terrible situation. How did I want cancer to be defined? I had the ability to make the meaning of word cancer to my children, husband, and family. I realized my family was going to go on this journey with me. It would be the experiences we faced that would define their perspectives on cancer, on facing life’s adversities, and on me. Keeping a positive outlook becomes a choice. It was a choice to smile during pain, to be strong when tired, to be hopeful when sad, to laugh when hurting, to stay happy during difficulty, and to keep a positive self-image after baldness, scarring, and illness. I made choices to be positive rather than negative.